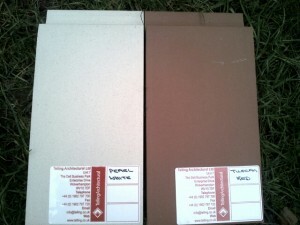 Pearl White and Tuscan Red. We submitted the final choice of materials for the external elevations to Fylde Borough Council in January 2014. The Planners approved these timeously which enabled the materials to be ordered to meet the construction schedule. 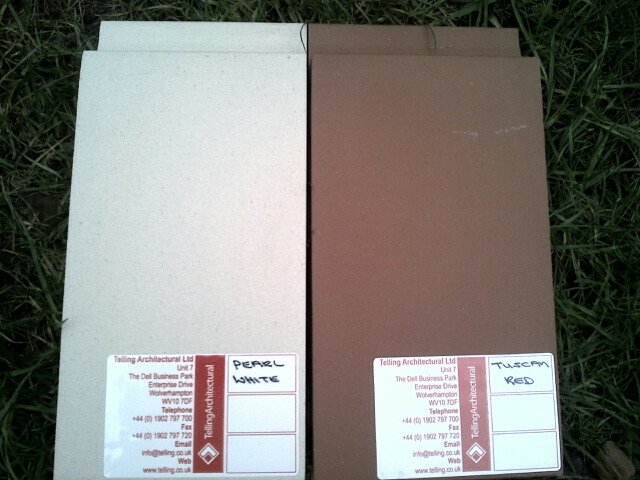 The approved colours for the rainwater cladding are Tuscan Red and Pearl White (see samples in attached photo). These colours are consistent with the original colour scheme for the refurbished and extended building as designed by Manning Elliot Architects, as shown in the banner at the top of the page. The cladding was specifically selected to complement the colour and texture of the traditional brick materials of Lytham. The materials will greatly enhance the building of Jubilee House and bring it into the 21st Century in a way that is sympathetic with its surroundings. This entry was posted in Design, News, Planning and tagged Fylde Borough Council, Jane Fox, jubilee house, Manning Elliott, rainwater cladding by Helen Broughton. Bookmark the permalink.